Liczba stron: 1231 Jest to ujednolicona liczba stron, która ułatwi Ci porównanie długości książek. Każda strona Legimi to 200 słów. The Unofficial History of the Forest of the Literati. A novel of the iconoclasts and intellectuals of the late Ming period. The long and glorious tradition of classical realist literature in China was carried forward in the middle of the eighteenth century by two outstanding novelists—Tsao Hsueh-chin, author of The Dream of the Red Chamber, and Wu Ching-tzu, author of The Scholars. Although Wu Ching-tzu was born some twenty years earlier than Tsao Hsueh-chin, The Scholars and The Dream of the Red Chamber were written during the same period. Chinese feudalism, the development of which had long been retarded, was in a state of decline. Several decades had passed since the invasion of the Manchus, who by military might and political measures had gradually consolidated their rule. The peasant revolts and risings against the Manchus of the early years of the Ching Dynasty had been suppressed. The people led a wretched life, and the contradictions in society were sharply reflected in the conflict within the ruling class itself. Ruling cliques, growing ever more corrupt and spiritually bankrupt, were fighting among themselves. Both Tsao Hsueh-chin and Wu Ching-tzu were born into ruling class families which had come down in the world. With deep insight into the rottenness and hopelessness of their class, each made use of what he himself had seen and experienced to paint a great canvas. Tsao took marriage as his central theme, to reflect the vices of the aristocratic ruling class which was nearly played out. Wu wrote of officials and examinations, to expose the decadence of the literati and the government. Although the two men looked at life from different angles and described different facets of society, the nature of the problems they raised was the same: they both exposed the iniquitous feudal system and feudal rule of their time. ____________________ 1 Professor of Chinese literature in Peking University. In his Outline History of Chinese Fiction, Lu Hsun states that The Scholars is the first Chinese novel which is a social satire, and that in this respect it has never been surpassed. If we want to understand The Scholars, there are certain important facts about Wu Ching-tzu’s life and thought which we must take into consideration. Wu Ching-tzu was born in 1701 into a distinguished family in Chuanchiao County in the province of Anhwei, on the north bank of the Yangtse River. Many of his clan had held high government posts during the time of his grandfather and great-grandfather; thus for the fifty years at the end of the Ming and the beginning of the Ching Dynasty his family had prospered. Wu’s grandfather died early, however, after a less successful official career than his brothers and cousins. And Wu’s father had been a county instructor for a few years only when he offended his superiors and was dismissed from office, dying a year later. Wu Ching-tzu lost his mother when he was thirteen and his father when he was twenty-three. His father’s experience disillusioned him with officialdom; and, coming from a distinguished family, he became a spendthrift who despised wealth. In a few years he ran through his property. His servants and dependants deserted him, his wealthy relatives looked down on him, and snobbish neighbours coldshouldered him. Finding it impossible to stay in his native place, he moved at the age of thirty-three to Nanking. Very soon he was quite destitute and, until his death in Yangchow in 1754, had to live on his writing and the assistance of friends. Often he had to sell old books to buy food, and sometimes he went hungry for several days on end. During the gradual decline of his family and his own rapid impoverishment, he suffered a great deal and gained a wealth of experience which strengthened his sense of justice and made him a sensitive, cool-headed observer of reality. This helped him to understand the nature of the class to which he belonged, and made him sympathize with the common people. He saw through the decadence and shamelessness of scholars under the Manchu despotism, and perceived the viciousness of the government and the degeneracy of society. He was, therefore, increasingly drawn to the humble, unsuccessful people with whom he came into contact. In short, Wu Ching-tzu’s personal experience was the source of his sober realism. Though Wu’s father and grandfather were unsuccessful in their official careers, they both retained their faith in the moral precepts of Confucius and Mencius. And Wu was deeply influenced by them, especially by his father. His contempt for officialdom, wealth and rank, and his emphasis on principle, were rooted in his family upbringing. Of course, in that society and under the influence of the literati of the time, it was impossible for any man to be completely indifferent to officialdom. After passing the prefectural examination at twenty, Wu Ching-tzu sat for other examinations. When he was thirtysix, he went to the provincial capital to sit for a special examination for which the governor of Anhwei had recommended him. Later, however, when recommended to go to the capital for the palace examination, he declined. For after seeing the mortification of friends who had failed in the palace examination he had finally made up his mind to take no more examinations himself. Without this bitter experience over so many years, Wu could never have felt such disgust for officialdom or the paku essays, 1 and examination system by which these were attained. Nor could he have seen so clearly through ordinary men and affairs to unmask the bane of the society and political life of his time, which he pointed out with such realism and satirical humour. These apt generalizations give us the main theme of The Scholars in a nutshell. The choice of this theme was the outcome of deep thinking and genuine feeling on the author’s part; and all the characters and incidents in the novel are based on keen observation and personal experience. ____________________ 1 A type of essay specially designed for the civil service examinations. The form, number of words, and language were strictly prescribed, and isolated quotations from the Confucian classics were chosen as subjects. It was given the name paku (eight paragraphs) because each essay must have no more and no less than eight paragraphs. and harshly repressing others. In the twelfth year of his reign he invited certain outstanding scholars to court; but those of any integrity, who were loyal to the Ming Dynasty, did not rise to this bait. Five years later, he introduced a new system for promoting learned men, and ordered the ministers in the capital as well as the provincial officials to recommend scholars and compel them to go to the capital for an examination. To deal with the rank-and-file intellectuals, he promoted the civil service examinations, to pass which men had to be able to write paku essays. Thus to master this form of composition, many men frittered away their lives in futile study. And, finally, Kang Hsi set up the Bureau for the Compilation of the Ming Dynasty History, which was joined even by scholars who had hitherto refused to work for the Manchus, for they feared lest otherwise Ming Dynasty history might be distorted. With very few exceptions, all intellectuals fell into Kang Hsi’s trap. So the paku essay began to reign supreme, and this was a dark age for genuine scholarship. Chang Hsuehcheng, a historian of the reign of Chien Lung, declared that, from the beginning of Yung Cheng’s reign to the middle of the reign of Chien Lung, paku essays were so much the vogue that the literati actually thought the study of the classics unorthodox and writing poems and essays in the classical style frivolous. Unless a man could write paku essays, he was not considered a scholar. This completely confirms the descriptions in this novel. At the same time that scholars were being bribed or deliberately kept ignorant, the rulers carried out a policy of cruel suppression. The massacre following the trial involving the Ming Dynasty History in the third year of Kang Hsi was only one of many. Because this history had been based on facts and expressed certain anti-Manchu sentiments, the emperor ordered the execution in the most brutal manner of the writer’s entire clan, the scholars who wrote the prefaces, the editors, printers, even the book-sellers and purchasers, as well as the local officials and all their kinsmen. The writer, Chuang Ting-lung, had died; but his body was exhumed and cut into pieces. Later, during Wu Ching-tzu’s lifetime, there were some even more cruel massacres, involving greater numbers. Emperor Yung Cheng, who usurped the throne, relied even more upon terror. Almost every year there was a great trial of intellectuals, which ended in the butchery of many innocent people. Since Yung Cheng reigned from the time when Wu Ching-tzu was twenty-three till he was thirty-five, the impression made on Wu by these events must have been very strong. He probably began writing The Scholars during the first years of Chien Lung’s reign, when he was nearing forty, and completed it before he was fifty. By this time there was less terrorism, but the threat of it still remained. Under these circumstances, considerable courage was needed to write an exposure of the government and society of the time which would very likely offend the censors. Great skill was also required to cloak the author’s indignation and patriotism, in order that he might not find himself in trouble. For the most part, Wu Ching-tzu used real people and real incidents as material for this book. Tu Shao-ching is a portrait of the author himself, while Chuang Shao-kuang is modelled on his friend Chen Ting-cho. We know that Tu’s refusal to accept official recommendation and the sacrifice at Tai Po’s Temple in Nanking are founded on facts. However, the author interspersed these experiences of his with many imaginary episodes, and disguised the political and social reality of his time as happenings which took place in the Ming Dynasty. He had to do this in order to avoid offending the government. Moreover, this enabled him to write more trenchantly, and make the best use of the satire in which he excelled. 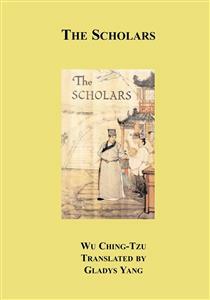 In the first chapter of The Scholars, where Wu Ching-tzu wants to make clear the meaning of the whole book, he chooses a historical figure, Wang Mien, selects from Wang Mien’s life all that is relevant to his own conception of an ideal man, and portrays him as a model for later scholars. Wu Ching-tzu makes it clear that this chapter points the moral of the novel. Wang Mien’s type of scholar had always been admired in ancient China during the golden age of which Wu dreamed, when the literati came between the ruling class and the people. Administering the country for the ruling class, scholars had a special position. According to tradition, it was their duty to do good deeds for the emperor, to watch over the people’s interests and, to a certain extent, to listen to the voice of the people. In this way the feudal system could be securely maintained. Thus whenever the rulers flouted the wishes of the people by acts of tyranny, some scholar of integrity would make the gesture of going to live as a hermit. Hence Wang Mien, as depicted by Wu Ching-tzu, epitomizes the traditional integrity of the scholars of ancient China; for by refusing to accept an official post he expresses his protest against oppressive rule. By using Wang Mien to point the moral of the book, Wu Ching-tzu presents his main theme clearly and provides a criterion by which all the other characters may be judged. But, while exposing the political and social evils under Manchu rule, the main attack in this novel is directed against the literati. The central theme of The Scholars is the attitude of the literati towards the examination system which led to position and wealth. In feudal China scholars were a very important social group, and often exerted a great influence on the people. The Manchu invaders were numerically inferior and their cultural level was low, while the Chinese had a long history and a great civilization. Hence the Manchu rulers from the first paid special attention to the control of the literati. Taking over the infamous examination system of the Ming Dynasty which tested scholars by means of the paku essay, they used this as the chief means to win over and lead scholars astray, restrict learning and suppress freedom of thought. This is why the novel makes such a powerful attack on the paku essay and satirizes the scholars who try so desperately to become officials. In the first few chapters of The Scholars, Wu Ching-tzu opens fire on the examination system itself. Chou Chin and Fan Chin lead miserable lives before passing the examinations, but once they pass they feel as if transported to heaven. After Chou Chin passes, Mei Chiu, who formerly laughed at him, brazenly claims to be his pupil. His calligraphy is carefully taken down from the wall to be kept as a great treasure, while the villagers who despised him and dismissed him from his post as teacher now build a shrine for him, and treat him as if he were a god. Fan Chin, again, when we first meet him is on the verge of starvation. When his family has gone without food for two days, he has to take a laying hen to the market to sell. But then, in the twinkling of an eye, he gets land, houses, servants, fine porcelain and cups and chopsticks inlaid with silver. By passing the examinations, scholars who have been trampled underfoot suddenly become officials who can lord it over everybody else. Inevitably, they make desperate attempts to pass. There was no fixed standard of scholarship, however. Chou Chin, who sits for each prefectural examination, does not pass until he is an old man. Then he has a sudden run of luck and soars to great heights. Fan Chin, too, does not pass until his hair is grey. Then he is examined by Chou Chin, who sympathizes with him on account of his age, and reads his paper three times. At first he thinks Fan Chin’s essay very poor. “Whatever is the fellow driving at?” he wonders. “I see now why he never passed.” But after reading it three times, he decides that it is “the most wonderful essay in the world—every word a pearl.” And so, before even looking at the other papers, he marks Fan Chin first on the list. This was the kind of farce the examination system was, and the absurd way in which rank and riches were won. Yet it was precisely this absurd farce that sent scholars off their heads, making them lose all sense of right and wrong, and abandon all their ideals and convictions. Stupidity and ignorance are characteristic of these men set on official careers. Chang Ching-chai and Fan Chin—both scholars— talk all sorts of nonsense about Liu Chi 1 to Magistrate Tang, but have no knowledge at all of recent history. And Fan Chin, who is an official, has never even heard of the famous Sung Dynasty poet Su Tung-po. Dishonesty is another common fault. Thus Senior Licentiate Yen seizes a neighbour’s pig, cheats people out of money, steals a widow’s property, and pretends his walnut wafers are medicine worth hundreds of taels of silver. The scholars’ ranks were filled with such brazen hypocrites. Greed made them boast, cheat and fawn on their superiors. Yet instead of thinking such conduct reprehensible, they had a high opinion of themselves. Since most of the officials of that time were the stupid and shameless “scholars” produced by this examination system, it is no wonder that the government was corrupt. Thus we see Magistrate Tang of Kaoyao County acting quite irresponsibly. When the Moslems ask for permission to sell beef, he takes the advice of another fool, and has an old man killed. He causes a great uproar, yet in the end is allowed to punish the Moslems in order to preserve his face. Again, when Prefect Wang goes to his post at Nanchang, his one thought is: “Three years of good government—one hundred thousand taels of silver.” Because he practises ruthless extortion, he becomes known as the ablest officer in Kiangsi and is very quickly promoted; while more humane officers like the magistrates of Wenchow and Antung are censured and dismissed from their posts. As for the minor functionaries in government offices, they are most of them wily scoundrels, who do many unprincipled things. Through seemingly casual incidents, the novel gives a most penetrating exposure of the government at that time. ____________________ 1 An early Ming Dynasty statesman. In addition to describing scholars who are eager to become officials, Wu Ching-tzu depicts many pseudo-scholars who are cheats and charlatans. Such men, having failed in the examinations, cannot win wealth or position; but they try to take a short cut to respectability by learning doggerel verses and posing as lofty characters. They run after the rich and powerful, lying to and fawning on their patrons in order to swindle them or win some other advantage. Niu Yu-fu and Ching Lan-chiang are men of this type. From this we can see that the author made a comprehensive study of the corrupting influence of the examination system on society and on the government administration. As a result, he naturally inclined towards two types of men. One type were those high-minded scholars who despised worldly success but believed in the good old ways and prized moral character and learning, like Wu Ching-tzu himself. Such men— Dr. Yu, Chuang Shao-kuang, Tu Shao-ching, Chih Heng-shall and the like —are the positive characters in this novel. The other type were the humble folk and the failures. Leading a hard life, uninfluenced by the imperial examinations, they retained their sterling qualities. Thus we see how the actor Pao Wen-ching helps Old Ni and the kindness of the monk in Sweet Dew Temple to Niu Pu-yi. We see what a good son and brother Kuang Chao-jen is before he rises in the world, and how unselfishly Ma Chun-shang assists him. These are instances of the deep feeling with which the author expresses the true goodness of people in humble stations of life. His admiration is even more clearly apparent in the first chapter, when he depicts Wang Mien’s life in the country, and in his description of the four eccentrics in the last chapter. The humanity and integrity of these men who are not scholars are vividly contrasted with the ugly ways of those men of letters who seek officialdom. The author’s humane and enlightened views on women and the relationship between men and women are much in advance of his time. His ideas may not be radical enough, and may sometimes even appear self-contradictory; but it is clear that he opposes feudal morality. He is not against the entire feudal marriage system, but his description of Pao Ting-hsi’s marriage to Mrs. Wang lays bare its evils. Similarly, although he is not completely opposed to the inhuman feudal conception of chastity, which forbade young widows to marry again and commended them if they committed suicide, his account of the death of Wang Yu-huei’s daughter reveals the cruelty of such a moral code. His attitude to the relationship between husband and wife can be seen from the sketches of the family life of such positive characters as Chuang Shao-kuang and Tu Shao-ching. We see Tu and his wife making a pleasure trip to Chingliang Mountain, and Chuang Shao-kuang and his wife drinking and reading together at Lotus Lake. These episodes challenge the usual conventions, for such a relationship between husband and wife was frowned upon by feudal moralists and generally tabooed. Wu also opposes concubinage as an institution, and depicts the unhappiness and humiliation of girls like Shen Chiung-chih. “In the half year that I have been in Nanking,” she tells Tu Shao-ching and Wu Shu, “all the men who have come here have taken me either for a prostitute or a member of some brigand’s band. How I despise such people! Today you two gentlemen have come neither to take advantage of me, nor because you suspect me.” The author’s sympathy and respect for this girl grow out of his hatred for that mercenary society. Later, Tu Shao-ching says: “Those rich and powerful salt merchants live in such luxury that scholars often cower before them. You are a weak woman, yet you hold them as cheap as dirt. Admirable!” In word and deed this girl is a real heroine, who keeps her head when the runners come to arrest her and during her trial. Similarly, fortune-telling is held up to ridicule. The fortune-teller Ting says very clearly, “Our fortune-telling is nothing but a trick, sir. Just choose a good day and start. You don’t need to have your fortune told.” Elsewhere, while describing how Kuang Chao-jen makes a living by fortune-telling when stranded in Hangchow and the blind man boasts to the prostitute Pin-niang, Wu attacks the idea that everything is determined by fate—an idea used by the rulers to deceive the people. In feudal China two hundred years ago, when superstitious ideas were rife, to express such opinions was very courageous indeed. “Truth is the life of satire,” wrote Lu Hsun. “Satire must be based on the portrayal of reality.” Satire therefore implies realism, and it is realism and patriotism that give life to Wu Ching-tzu’s satiric art. Nearly all the characters and incidents in The Scholars are strictly true to life, and could be found anywhere in China during the Ching Dynasty. But in people and events which others might find insignificant or commonplace, the author with his sober realism and keen powers of observation recognized all that was ridiculous and despicable. And, impelled to express what he saw, he depicted it with sympathetic understanding, hoping, as stated in the preface, that readers of every type would find themselves mirrored in his book. The Scholars presents several positive characters, emphasizing the contempt for position and wealth which makes them so different from the average scholar. These men preserve their intellectual and moral integrity. But they are all living human beings, each with an individual personality, not merely a combination of abstract qualities. And as human beings in a real society, they cannot be perfect. Dr. Yu, for instance, who is presented as a true scholar, is not without his faults. He lets his nephew have the use of his house in the country, and when his nephew sells the house and comes to ask for more money to rent another house, Dr. Yu gives him all he wants. In his generosity he is actually encouraging his nephew’s bad habits. In the same way, Tu Shao-ching makes friends with such worthless characters as Mr. Tsang and Iron-armed Chang. He swears at Tsang, “You ruffian! You are utterly contemptible!” Yet he goes on mixing with such people, and gives them large sums of money. This is why old Mr. Lou blames him for not distinguishing between good and bad—a typical fault in young men from wealthy families. In such portraits we cannot say there is no criticism implied; but in the main these are positive characters, and readers today do not find them unsympathetic because they are all genuine human beings. The author’s condemnation of his negative characters cannot be considered as personal attacks. On the contrary, Wu Ching-tzu has a deep sympathy for all his characters and makes his readers feel that these degenerate scholars, ridiculous and despicable as they may be, are also much to be pitied. For it is clear that they are not by nature bad, but that their outlook and personality have been warped by an evil system. Wu Ching-tzu believes men are by nature good. He portrays Kuang Chao-jen, Wang Yu-huei and others as victims of their environment who, having lost their original goodness, grow decadent and ignorant. That is to say, in his delineation of character the writer exposes the true nature of the society of his time, and by holding certain scholars up to ridicule he attacks the ruling class and social system. Though living in evil times, however, Wu Ching-tzu never lost heart, but longed for a force to carry on the past tradition and point the way to a brighter future. Such a force would find expression in human dignity, in the upholding of ideals of justice and truth, in the love of life and creation. Wu obviously realized that no such force could be found among the scholars of his time, whether rich or poor. He had no illusions that the literati would build a brighter future, as he concludes at the beginning of the last chapter of The Scholars. But he then goes on to describe four eccentrics who are men of integrity and moral conviction. One is Chi Hsia-nien, the calligraphist who has been homeless since his childhood, and who stays in monasteries. Another is Wang Tai, the chess player who sells spills and comes from a family of market gardeners. Yet another is Kai Kuan, an old man who has lost his property and opened a tea-shop, but who paints well and loves books. And lastly there is Ching Yuan, the tailor, who after working every day at his trade spends his spare time playing the lyre, practising calligraphy or writing poems. Thus, among the lower walks of life, outside the ranks of the scholars, Wu Ching-tzu discovers a force holding out hope for the future. From his observations of ordinary people and incidents, Wu Ching-tzu is able to grasp the essence of things. By simple, seemingly casual descriptions, he gives full, profound pictures of inevitable development. For example, what distresses Chou Chin so when he goes to the examination school that he dashes his head against the desk? The answer to this is found all through the second chapter. Before Chou Chin appears on the scene, we see that corrupt society, and begin to understand the feelings of a poor scholar who has failed to pass the examination although his beard is turning white. Mei Chiu insults him, a boastful provincial graduate bullies him, and he even loses his meagrely paid job as school-teacher and has to work for his brother-inlaw as an accountant. Through these detailed narrations the author conveys Chou Chin’s hidden bitterness and despair. Thus once the old man enters the examination cell and sees the desk, his eyes smart, he gives a long sigh, then knocks his head against the desk and falls unconscious. This has become the natural, inevitable climax, and there could be no better way of exposing the iniquitous nature of the examination system. Why, we may ask, does Fan Chin go out of his mind after passing the provincial examination? It is because he has been taking examinations all his life, longing to pass yet never believing that he will. After his feelings have been pent up so long, the sudden joy of passing is too much for him. The account of his fit of madness makes readers laugh, but excites their sympathy too. And this episode is portrayed so convincingly and with such insight that it reads more like fact than fiction. Fan Chin’s old mother, who is like her son in many ways, is not so excited by the news of his success; for she is a peasant woman who cannot understand the full significance of passing the provincial examination. When, however, she realizes that all the fine porcelain, the cups and chopsticks inlaid with silver, and all the servants and houses belong to her, that is a concrete situation that she can understand. Then she gives a scream of laughter and falls unconscious too. Kuang Chao-jen, again, starts life as a good, industrious, poor man’s son; but by degrees he grows corrupt and shameless. This is because there is a streak of cunning in his nature, and the circumstances make him want to rise in society. Once he has the means of doing so, he naturally becomes an opportunist. All these descriptions are truthful and penetrating, containing nothing inaccurate or distorted. Wu Ching-tzu’s characterization is worthy of detailed study. Much of Wu Ching-tzu’s humour is indirect: he excels in innuendoes. For it is the tradition in our classical literature not to express judgements directly, but to convey the author’s ideas through concrete figures and episodes. This means that the author’s own views must accord with objective reality. There are some passages in this book, however, where this is not the case. In chapters forty-four to forty-seven, in the sections dealing with the morals and conventions of Wuho County, the author’s views are sometimes directly expressed. These passages are not typical of the novel as a whole. Again, the adventures of Kuo, the filial son, in chapter thirty-eight, the description of Hsiao Yun-hsien in chapters thirty-nine and forty, and the battle against the Miaos in chapter forty-three, contain unrealistic passages which are poorly written. Moreover, the sentiments expressed here sometimes contradict the ideas of the book as a whole. Since it has been stated that Wu Ching-tzu’s novel originally comprised fifty chapters only, it is quite possible that a number of these passages are later interpolations. Apart from the sections just mentioned, Wu Ching-tzu’s style is characterized by his ability to express the profoundest ideas in the simplest language, to select from all the phenomena of life what is most significant, and to go to the heart of every problem he tackles. Besides being vivid and lifelike, the dialogue and delineation of character in The Scholars excel by their succinctness. Dialogue is used with great skill to reveal the speaker’s thought and personality. The author also describes certain telling gestures which shed light on a man’s character. In the forty-fifth chapter, when the Yu brothers examine the soil and talk of geomancy, their gestures are so well described that we can almost see these fools trying to mystify and impress their hearers. The whole book is filled with incidents of this sort, which may look trifling; but it is precisely through them that the characters and their inmost thoughts are revealed. In the twenty-eighth chapter Chu-ko Tien-shen is described as a countryman who does not recognize sausages. “What are these?” he asks. “Taste them and see,” says Hsiao. “It’s bacon,” says Chu-ko after a couple of mouthfuls. Chu-ko cannot recognize jelly-fish either. This may seem insignificant. Yet this simple soul, who has never even seen sausage and jelly-fish, comes to Nanking when he has two or three hundred taels to find some famous scholar to publish a selection of paku essays in his name, so that he may win fame. And it is laughable yet pathetic to see how penniless scholars like Hsiao Chin-hsuan and Chi Tien-yi help him to spend all his money. In the fifty-five chapters of this novel we find nearly two hundred clearly delineated and unforgettable characters, fifty or sixty of whom have major parts to play. Each chapter has one or more central figures, with subsidiary figures to create the necessary background; for the characters’ thought and personality are expressed through their relations with others as well as through everyday life. A character may be the main figure in one chapter, but only of secondary importance in the next when someone else takes the centre of the stage. This process continues throughout the book, presenting the reader with endless variety and a succession of new incidents, all of which are related in time and space. These different characters engaged in different occupations are displayed to us in succession, like waves which impel each other forward, interlinking to form one huge canvas. In short, The Scholars combines the characteristics of novels and short stories in a distinctive form—a highly flexible form admirably fitted to express the content of this book. And in certain ways this novel, which has some of the features of a serial story, resembles the long scrolls of ancient paintings which, when unrolled, reveal a vast, fascinating panorama. Men in their lives Go on different ways; Generals, statesmen, Saints and even immortals Begin as ordinary people. Dynasties rise and fall, Mornings change to evenings; Winds from the river Bring down old trees From a former reign; And fame, riches, rank May vanish without a trace. Then aspire not for these, Wasting your days; But drink and be merry, For who knows Where the waters carry the blossom Cast over them? The idea expressed in this poem is the commonplace one that in human life riches, rank, success and fame are external things. Men will risk their lives in the search for them; yet once they have them within their grasp, the taste is no better than chewed tallow. But from ancient times till now, how many have accepted this? “Yes, mother,” said Wang Mien. “I find sitting in school boring anyway. I’d rather look after buffaloes. If I want to study, I can take a few books along to read.” So that very night the matter was decided. The next morning his mother took him to the Chin family next door. Old Chin gave them some breakfast, and when they had finished he led out a water buffalo and made it over to Wang Mien. Wang Mien’s mother thanked Old Chin and turned to go home. Her son saw her to the gate, and there she straightened his clothes for him. Wang Mien nodded assent. Then, with tears in her eyes, she left him. From this time onwards, Wang Mien looked after Old Chin’s buffalo; and every evening he went home to sleep. Whenever the Chin family gave him salted fish or meat, he would wrap it up in a lotus leaf and take it to his mother. He also saved the coppers he was given each day to buy a snack with, and every month or so would seize an opportunity to go to the village school to buy some old books from the book-vendor making his rounds. Every day, when he had tethered the buffalo, he would sit down beneath the willows and read. So three or four years quickly passed. Wang Mien studied and began to see things clearly. One sultry day in early summer, tired after leading the buffalo to graze, he sat down on the grass. Suddenly dense clouds gathered, and there was a heavy shower of rain. Then the black storm clouds fringed with fleecy white drifted apart, and the sun shone through, bathing the whole lake in crimson light. The hills by the lake were blue, violet and emerald. The trees, freshly washed by the rain, were a lovelier green than ever. Crystal drops were dripping from a dozen lotus buds in the lake, while beads of water rolled about the leaves. Just then, he saw in the distance a fellow carrying two hampers over his shoulder and a bottle of wine in his hand. Hanging from one hamper was a rug. The man spread the rug under the willows, and opened the hampers. Behind him came three men in scholars’ square caps, all some forty to fifty years old. Two were dressed in dark grey, and the third in a blue linen gown. Fanning themselves with white paper fans, they advanced slowly. The one in blue was fat. When he reached the willows he asked one of the men in grey, one with a long beard, to take the seat of honour, and another, a thin one, to sit on the rug opposite. He himself was evidently the host, for he sat in the lowest place and poured the wine. “Mr. Wei is a real scholar,” said the thin man. The three men talked on and on; but Wang Mien saw that it was growing late, and led the buffalo back. After that, Wang Mien no longer spent his savings on books, but asked someone to buy paints for him in the city, and learnt to paint lotus flowers. At first he did not do too well, but after three months he succeeded in capturing the very essence and shades of colour of the lotus. Though he painted on paper, his flowers seemed to be growing in the water, or as if freshly plucked from the lake and placed on a scroll. When the villagers saw how well he painted, some even bought his pictures. And when Wang Mien had money he bought good things for his mother. One person told another, until the whole of Chuchi County knew that he was a famous flower painter, and people vied with each other in their eagerness to buy. By the time he was eighteen he had stopped working for Old Chin, and spent every day doing some painting or reading old poems and essays. By degrees he no longer had to worry about his livelihood, and his mother was happy. Wang Mien had genius. While still in his teens, he mastered the whole field of astronomy, geography, the classics and history. He was, however, eccentric. He did not look for an official post, and did not even have any friends. All day he studied behind closed doors; and when he saw in an edition of the poems of Chu Yuan 1 a picture of the poet’s costume, he made himself a very high hat and a loose flowing gown. In the fresh and flowering spring he would take his mother out in a buffalo cart, and, dressed in his high hat and loose gown, flourishing the whip and singing songs, would drive all over the countryside and around the lake. Small groups of village children would tag after him, laughing; but he did not mind them. Only his neighbour, Old Chin, realized how remarkable he was; for Old Chin was an intelligent man, though a peasant, and he had seen Wang Mien grow up. He respected and loved Wang Mien, and often asked him to his thatched cottage to talk with him. One day Wang Mien was sitting in Old Chin’s cottage when a man wearing a bailiff’s cap and blue cloth gown came in. ____________________ 1 China’s earliest great poet (B.C. 340-278). Old Chin welcomed him, and after an exchange of courtesies they sat down. This newcomer’s name was Chai. He was a county runner and also a bailiff, but since Old Chin’s son was his godchild he often came to the village to visit their family. Old Chin hastily called his son to make tea, kill a chicken and cook some meat to entertain the bailiff, and asked Wang Mien to accompany them. Old Chin pressed Wang Mien to consent and, to please the old man, he agreed. He went home and took infinite pains to paint twenty-four pictures of flowers, each with a poem appended. Bailiff Chai reported his meeting with Wang Mien to the magistrate, who gave him twenty-four taels of silver. Of this sum Chai appropriated half, giving twelve taels only to Wang Mien. He took the flower album away with him, and then the magistrate sent it with some other presents to Mr. Wei. When Mr. Wei accepted the gifts, the album alone attracted his attention. He looked at the paintings again and again, liking them so much that he could scarcely take his eyes off them. The next day he invited Magistrate Shih to a feast to thank him. They exchanged greetings, and drank several cups of wine. When Magistrate Shih had taken his leave of Mr. Wei, he returned to his yamen and ordered Bailiff Chai to take an invitation card couched in most respectful terms to Wang Mien. Chai hurried down to the village to Old Chin’s house, and sent for Wang Mien to step over. Then he told him what his business was. They argued for some time. Then Old Chin prepared supper for the bailiff, and while he was eating told Wang Mien secretly to ask his mother for a little silver as messenger’s fee. Only then did Chai consent to go back. Then, however, it occurred to him that his subordinates might laugh at the idea of a county magistrate calling on a mere peasant. Yet Mr. Wei had spoken of Wang Mien with the greatest respect. “If Mr. Wei respects him, I should respect him ten times as much,” Magistrate Shih reflected. “And if I stoop in order to show respect to talent, future compilers of the local chronicles will certainly devote a chapter to my praise. Then my name will be remembered for hundreds of years. Why shouldn’t I do it?” So he decided to go. The next morning the magistrate called for his chairbearers. Taking only eight runners in red and black caps, and with Bailiff Chai in attendance, he went straight down to the village. When the villagers heard the gongs, young and old flocked round to see the chair. Then the procession reached a cluster of huts. Wang Mien’s door, of unvarnished wood, was firmly fastened. Bailiff Chai hurried forward to knock at the door, and after some time an old woman came out, leaning on a stick. “He is really not at home,” answered the old woman. “I don’t know where he is.” This said, she went in, closing the door behind her. During this conversation the magistrate’s chair had come up. Bailiff Chai knelt before the chair and said, “I asked for Wang Mien and found he is not at home. Won’t Your Honour go to the local office to rest for a little, while I make further inquiries?” Then he escorted the chair past the back of Wang Mien’s cottage. Behind the cottage were a few strips of arable land and a big lake, its banks thickly grown with elms and mulberry trees. Then more fields could be seen, stretching to the horizon. There was a hill too, covered with fresh green trees, only a few hundred yards away. If you shouted, your voice would carry there. And round the foot of this hill, as the magistrate’s chair advanced, came a little cowherd riding back to front on a water buffalo. When Magistrate Shih heard this, he flushed angrily and said, “In that case, I need not go to the local office. Let us go back to the yamen.” Thoroughly annoyed, his first impulse was to tell his attendants to arrest Wang Mien and punish him. Afraid, however, that Mr. Wei would call him hotheaded, he decided to swallow his anger and go back to explain to his patron that Wang Mien did not deserve to be honoured. He could punish the fellow later. Having reached this decision, he left.